You don't need fine cabinetmaking tools to get clean cuts in plywood. You just need a little know-how. 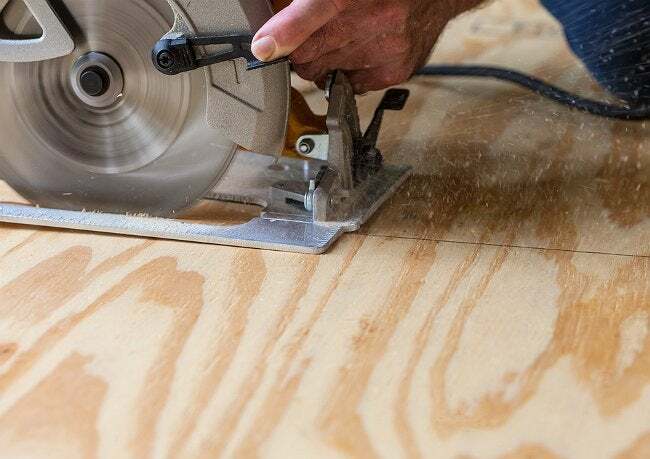 If you’re planning to cut plywood, here are a few points to keep in mind. Cutting plywood usually creates a splintered edge on one side of the sheet. That’s no big deal if your project requires only one side of the sheet to be splinter-free. Which side will the splinters be on? That depends on the type of saw you’re using to make the cut. Generally speaking, radial arm saws and table saws produce splinters on the top side of the sheet, while saber saws and circular saws splinter the wood on the bottom. If your choice of tools is a muscle-powered hand saw, expect splinters on the top. But what if you need both sides of the sheet to be free of splinters? Your best bet is to use the sharpest, stiffest knife you can find to make deep scores—on both sides of the wood—along the lines of the intended cuts. One caution: You’ll need to measure carefully to ensure your score lines end up in exactly the same place on both sides of the sheet. As always with power tools, make sure you don protective glasses and gloves before you start your cuts.